I’ve been hoarding birds, but thankfully only paper versions. Now that I’ve collected enough of them I decided to add them to our main level powder room. 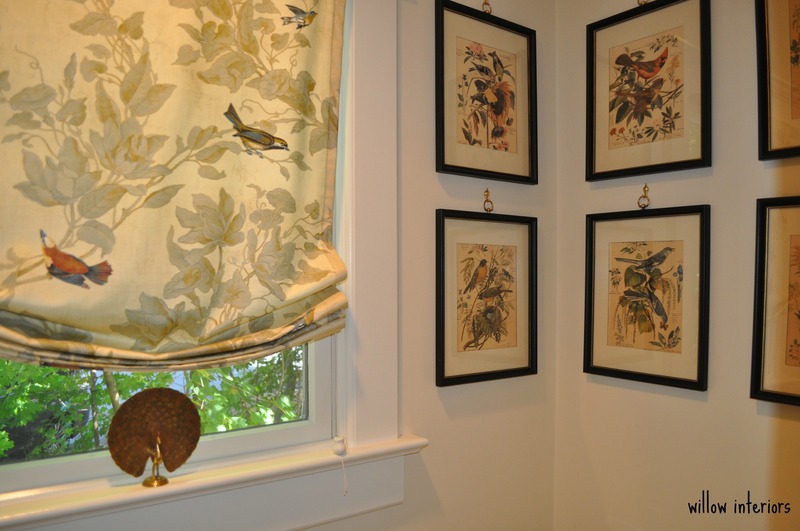 This is a tight room to shoot, but it is a powder room off of our mudroom with a pocket door. 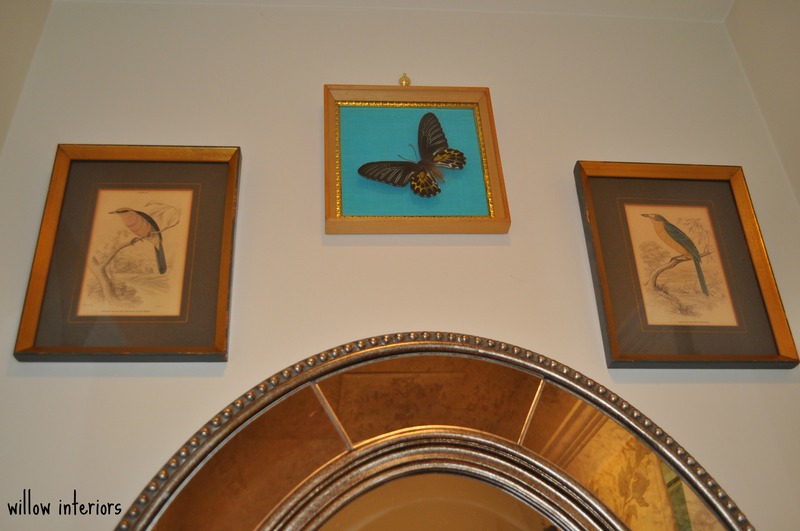 Above the mirror, is my butterfly taxidermy (that freaks the kids out). 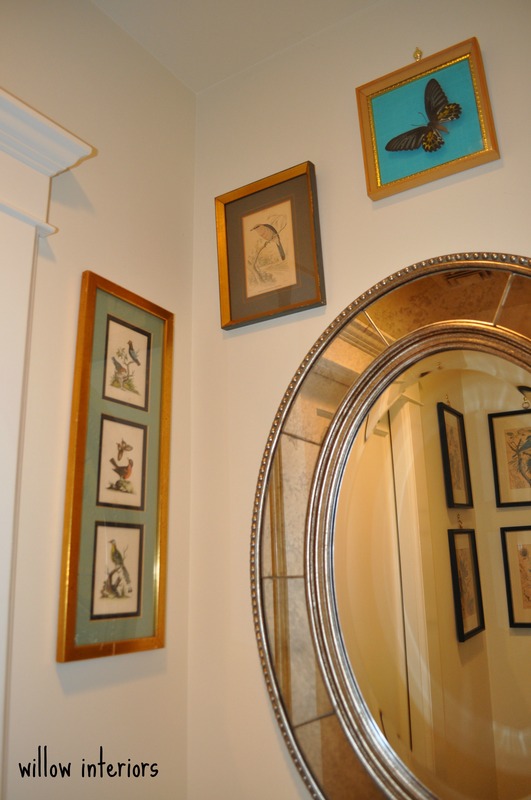 I found it while on a trip with my husband to Denver and the two birds over the mirror are from one of my local stores, Town Home and Garden, that I mentioned HERE. 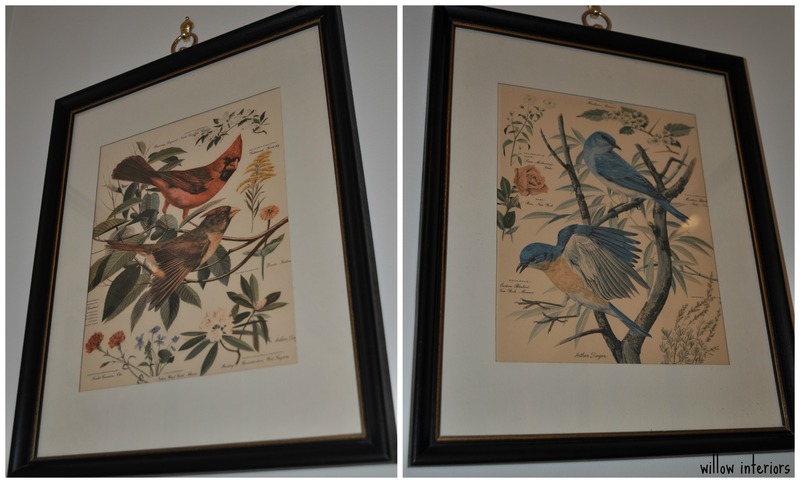 The two long frames on either side of the sink are also consignment finds. And I made the relaxed roman shade a couple of years ago with this fabric. 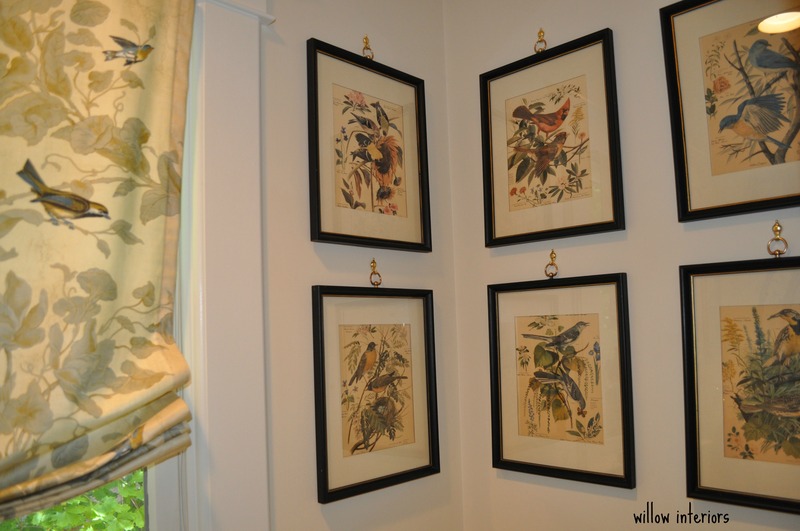 The details in these prints are so pretty and the brass hanging rings shined up beautifully! So, there’s my bird room. 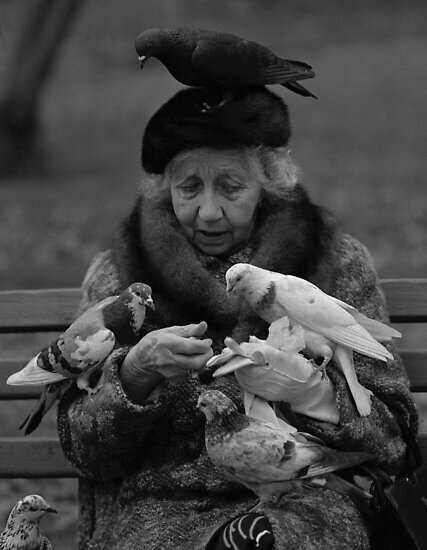 Please be nice to me when I retire and spend my days on the park bench feeding and talking to my friends. « Estate Sale at Something’s Gotta Give House in the Hamptons!!!! 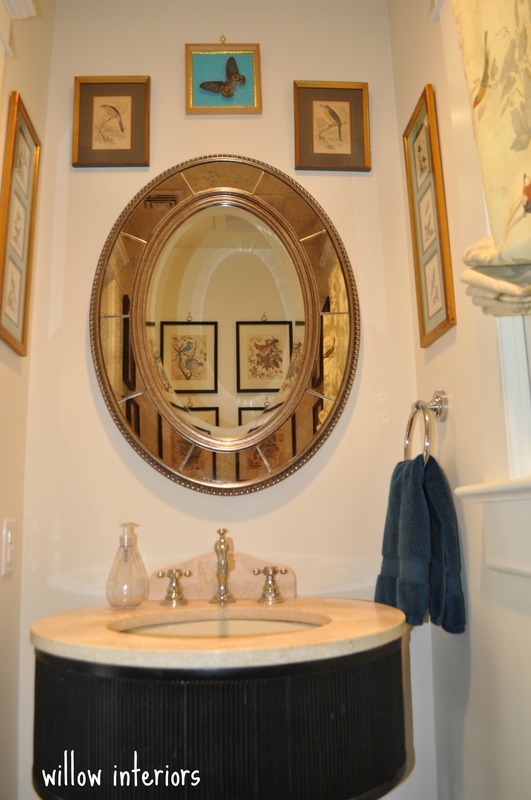 Lovely powder room. 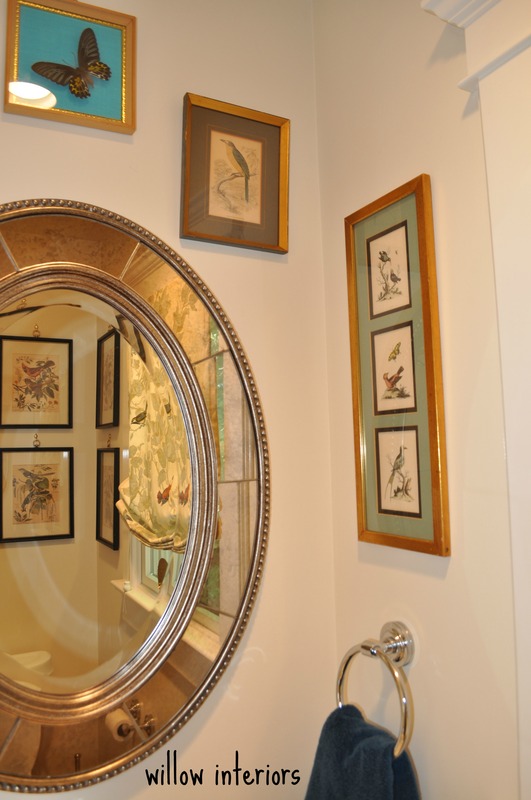 Where did you get the pretty hooks to hang the grouping above the toilet? I got them in my local hardware store and they are called push pin hangers. There are even more ornate ones, but I prefer simple. Here is a link to then on Amazon (http://www.amazon.com/Hillman-53500-Push-Pin-Hanger/dp/B000EU4HMI/ref=sr_1_2?ie=UTF8&qid=1411491786&sr=8-2&keywords=brass+push+pin+art+hanger). Thanks so much for stopping by! Pretty! I’ve always loved flocks of bird and butterfly silhouettes as artwork…now seeing them fashioned in real images is just magic. So much style for a small space! Awesome job Kate! Would love to get your thoughts on my latest design! 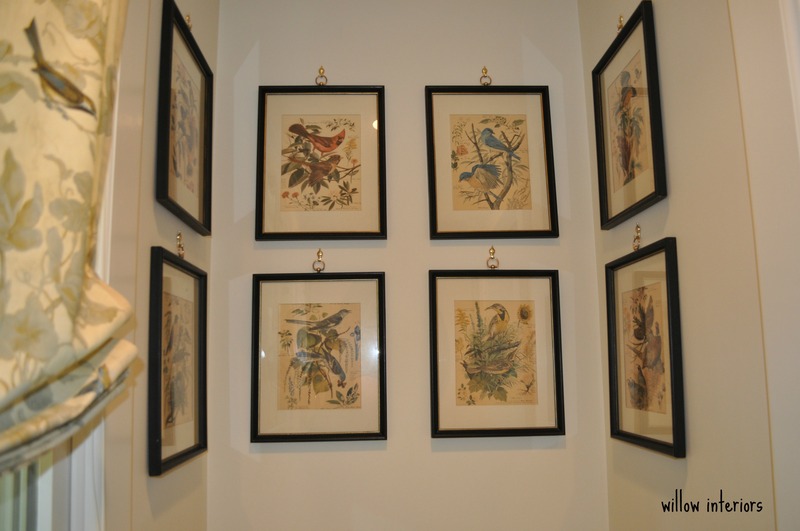 I enjoy bird art but not the real things – my kids laugh because I have a heart attack anytime they fly close overhead (have birds on me like that Bird Lady photo would be an absolute nightmare). But they look beautiful in your bathroom! I esp. like how that set is hung on the rings.